Aladdin and the Wonderful Lamp. 1917. - 9 Февраля 2018 - KinoSalon. Главная » 2018 » Февраль » 9 » Aladdin and the Wonderful Lamp. 1917. Aladdin and the Wonderful Lamp. 1917. Уникальный американский фильм октября 1917 года выпуска про Аладдина и волшебную лампу, основное отличие от последующих многочисленных вариаций есть возраст актёров - в главных ролях снимались дети в пределах 10-летнего возраста. 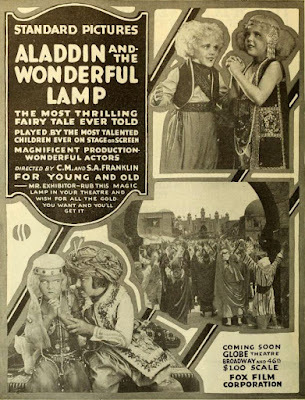 Aladdin and the Wonderful Lamp is a 1917 silent film fantasy directed by Chester and Sidney Franklin and produced and distributed by Fox Film Corporation. It is preserved in the George Eastman House, Cinemateca Do Museu De Arte Moderna and the Library of Congress. 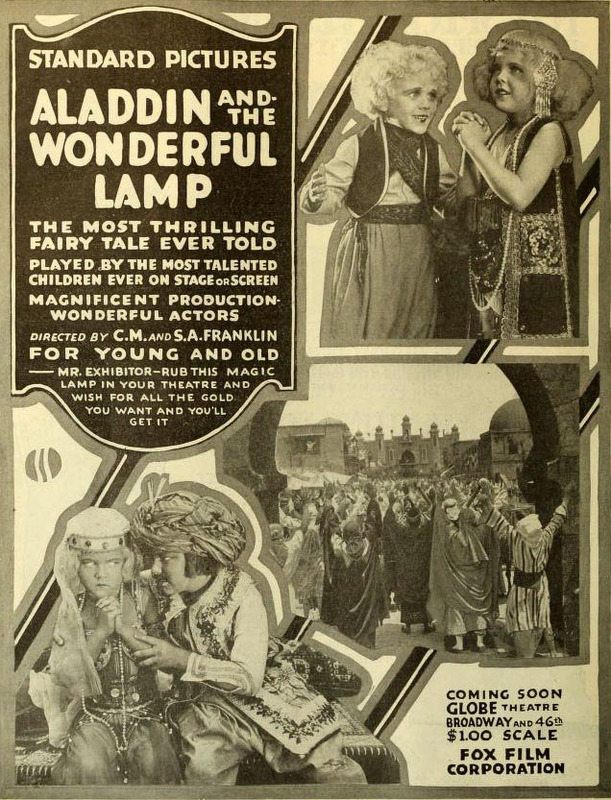 Aladdin and the Wonderful Lamp was another of Fox's lavishly produced "Sunset Kiddies" series, wherein most of the principal roles were enacted by children. In this case, Aladdin is portrayed by juvenile performer Francis Carpenter, while other key roles were filled by such stars-in-the-making as Virginia Lee Corbin, Gertrude Messenger and Buddy Messenger and Lewis Sargent. The film was by no means a parody: the youthful performers played their parts with utmost sincerity, and most effectively. As was traditional in the "Sunset Kiddies" films, a few adult performers were scattered throughout the proceedings, notably Elmo Lincoln, the screen's first Tarzan, who here portrayed the towering Genie of the Lamp. Unfortunately, none of the "Sunset Kiddies" efforts is currently available for reappraisal. Directors: Chester M. Franklin, Sidney Franklin. Cast: Francis Carpenter, F.A. Turner, Virginia Lee Corbin, Alfred Paget, Violet Radcliffe, Buddy Messinger, Lewis Sargent, Gertrude Messinger, Marie Messinger, 'Baby' Carmen De Rue, Elmo Lincoln, Joseph Singleton. Download Aladdin and the Wonderful Lamp.